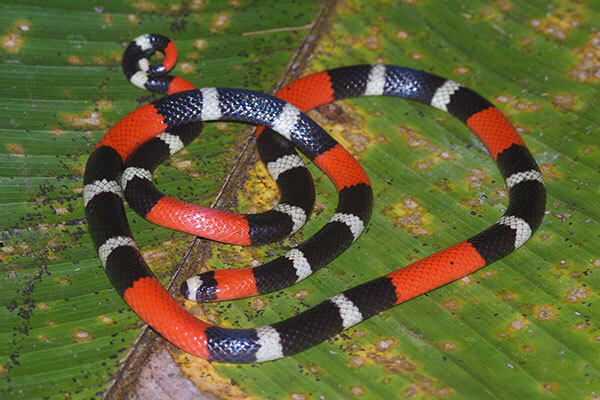 At the start of one of our nighttime forest walks, one of the Margarita Tours crew members ran up to Matt Cage to tell him that a coral snake had been found near one of the field station buildings. 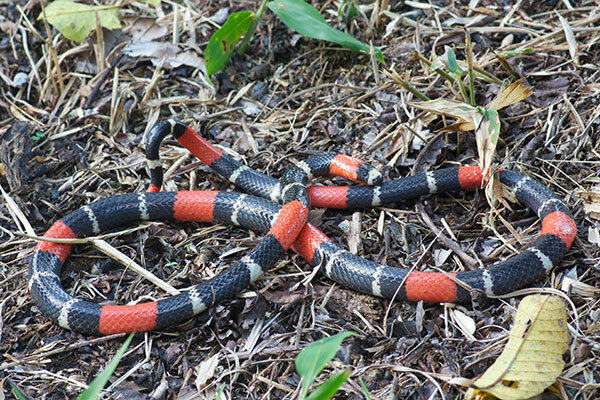 We hurried back to try to capture, or at least see, the snake before it slithered away into the vegetation. The latter goal was successful; I saw the snake, which was about six feet off the ground and climbing through some messy jungle. The former goal was not successful; the snake escaped without being captured or photographed in situ. The snake pictured here is a different individual, photographed in the "classroom" building on a table. This snake was found the previous evening by Gina Harper, when I was on a different trail.